Such a family film, this one. Everyone including John Leguizamo and his kids, director Carlos Saldanha's children, and Ray Romano with his son have voiced this animated movie, indicative of filial bonding and the fact that no one really cared about the actual film. Oh, you thought I meant this was a good film for you and your family to watch? Oops. To be fair, the main voice acting in Ice Age 3 isn't bad, neither is the quality of the animation. For a long time the Ice Age films have been used to sell many an LCD television set, and this one, in 3D in select cities, is no exception. The theme of the actual film, though, is where they dropped the ball. After having minted as much as they could out of the actual ice age, the makers decided to let history take a back seat and throw in some dinosaurs. So how did dinosaurs survive into the Ice Age? They didn't, but according to this film, they had a living, thriving "lost world" under the original one, and bumbling sloth Sid ends up there when an angry dinosaur whisks him away for taking her eggs. What follow are fart jokes, stupid humour, Simon Pegg as an adventurer gone insane, and the rest of the cast going through one slide, cliff, danger etc. after another. If your children have not watched a single Ice Age film, this might seem brilliant to them. If they have seen any number of animated films till now, as they are wont to, this flick is nothing more than fluff to pass the time with till Up releases, really. You, however, are going to be bored out of your skull most of the time, wishing there was more ice age in this Ice Age. The movie in itself is pacey, and enjoyable for the most part. The strength of this series have always been the enjoyable characters. However, by this movie the relationships have run out of steam. The strain of having a predator as a friend of the first film or the loneliness angst of Manny (Ray Romano) from the second one have given way to a forced camaraderie that has no conflict except the ones explored already, making most of the beats stale. It's then sometimes lively and sometimes listless, the film showing some animation wonder in the almost no-dialogue relationship between Scrat and Scratte, and then mixing it up with almost lazy direction around the main cast. There are moments where Sid acrobatically navigates ice traps with the ease of a skater, and there are moments that completely break the pace of the action. Every gem like the one where Sid brings up little dinosaurs making them feel more sloth-like, has an equivalent crude joke waiting around the corner. This gorgeous-looking film has what it takes to be a truly fun entertainer, but the directors are too busy bringing in everything they can to notice that, making an uneven film that cannot stand up to the best out there. It's up to you to decide if a movie that is exciting and boring for you in equal parts, but where your kids can spend some relatively fun, if forgettable, time, is worth the price of admission. If you happen to be an animation enthusiast without kids, however, there's much better fare out there. 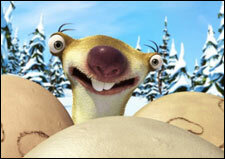 Be the first to comment on Ice Age 3! Just use the simple form below. fullhyd.com has 700,000+ monthly visits. Tell Hyderabad what you feel about Ice Age 3!